Do you wish to know how you can relax after an agonizing day due the hustles and bustles of your daily life? There are several ways people use for relaxation. But, one of the best is getting into a hot tub and let go of your day’s issues by feeling the water-massage on your body. In as much as a hot tub is the best way of relaxation, it can be a problem to control foaming no matter how careful you are in keeping it clean. Foaming is not the same as bubbles which you make happen by using bubble blower. Bubbles will make you feel even more relaxed by their flatter-feeling on your body. It is such a great experience! While foaming happens because of residues from body oil, soaps on clothes, shampoos left on hair, and others. Foaming, therefore, can rob you of that longed-for relaxation. Nevertheless, you can continue enjoying your hot tub if you have the best hot tub defoamer with you. Due to various defoaming products flooded in the market it can be tricky to recognize the effective one. This review and the buying guide will help you make the right decision in picking the best defoamer that will not only work on the foam, germs, bacteria but also clearing the cloudy water as well. First, get the highlights of the products in the review. Click on the product to have a preview of it before getting its details thereafter. What Would You Consider When Buying Hot Tub Defoamer? Q: Why is my hot tub foaming? Q: Why is a defoamer essential in a hot tub? Q: How frequently do I need to use defoamer in my hot tub? The Foam Down solution is specially made for hot tub users to enhance relaxation without any foam interference. It has a non-oily base making it to effectively work along with chlorinated, bromine, sanitized, biguanide and ozonated water. All you need to use is as little as 1/2 oz of the solution at a time to bring the foam down. 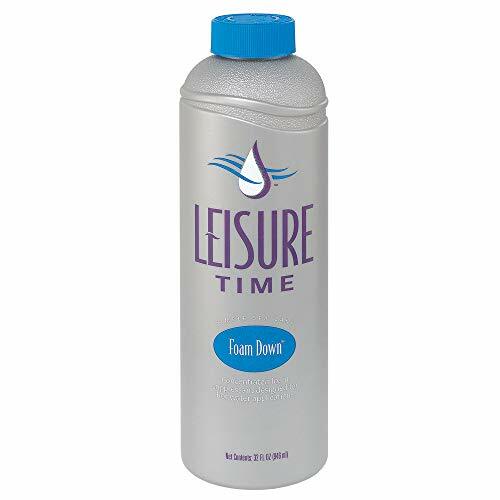 Leisure Time Spa Foam Down is compatible to use alongside chemicals such as cartridge cleaner, jet cleaner, fast gloss, filter cleaner, and others without interfering with their effectiveness as well. If after using Leisure Time Spa Foam and you notice there is still foam, then there must be an imbalance problem. In such a happening contact the nearest Leisure Time Dealer to come and check the water. Pool & Spa is a super concentrated solution with silicone formula that is water-based. It will not only leave your hot tub foamless but also cloudless. It does not interfere with other compounds in the water such as chlorine but leaves them safe and effective. The defoamer is responsible for leaving your water sparkling clean without leaving behind any residues such as oils, soap, and others that can cause cloudiness to your hot tub. A little of this defoamer will go way beyond your expectations leaving you and your water in an excellent state than never before. Try it out. You only need 1 or 2 oz which is enough for a 750-gallon hot tub. You can also use it to knock down foam in your pool, ponds, or decorative fountains. Follow the instructions for best results. This Spa and Hot Tub Defoamer by Bluewater Chemgroup is a water-based solution that can’t disturb water chemistry. As stated, it quickly takes foam down. You will witness the disappearance of the foam immediately you pour the solution in your hot tub. It is easy to use but with great results. No amount of foam can beat this Hot Tub defoamer. It is useful in leaving you with clear and cloudless water. The solution has silicone emulsion and therefore can cause an allergic reaction to anyone with silicone allergy. The Spa and Hot Tub Defoamer is made in the USA and therefore assures you of standardized quality. Follow the directions on the label for better results. See what others are saying about it here. SpaGuard eliminates foam build-up quickly without disturbing other hot tub chemicals such sanitation solutions which are bromine-based and chlorine in your hot tub water. It doesn’t also disrupt the pH balance in the water when effectively removing all foam in the hot tub using 1-squirt of the bottle. While working on the foam build-up, it clears all the germs and bacteria from water. Also it breaks all contaminants such as body oils, deodorant, soaps, shampoo, and many others foam agents leaving you worry-free. After defoaming your hot tub using SpaGuard, it will clear water with no left-over residues. The Spa Choice Foam Free is a concentrated formula suitable for those who have experienced problems in persistent foaming. It clears all foam to reach the filters and other equipment and therefore prevents foam recurrence. Nevertheless, it is safe and therefore, cannot damage any of its kits or clog the filters. The Spa Choice Foam Free does not interfere with water sanitization. It is therefore safe to use alongside other sanitizer systems. It will not only work on your hot tub effectively but will also do the same to your other water collections such as pools, fountains, and ponds. 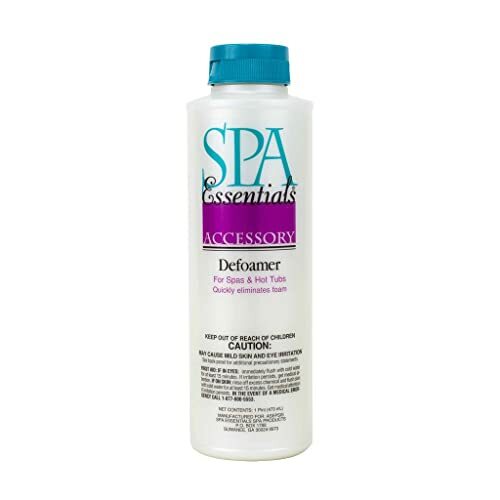 Spa Essential Defoamer is best suitable for eliminating foam and creating sparkling hot tub water. It does not only leave your water sparkling and free of all foam but also cleans the hot tub filters, all the surfaces, and other equipment as well. With Spa Essential Defoamer, you will be able to maintain foamless water without quick recurrences while balancing water. Spa Essential is not complicated to use since the instructions are easy to understand and to follow. With its 1-pint bottle size, it is easy to handle why applying it in your hot tub. This defoamer is effective in eliminating all foam in the water by working on all the root cause of the foam. By removing oils, soaps, other foaming agents, it prevents foam recurrence. The hth Spa Conditioner Defoamer is a solution for a user who is conscious of healthy skin. With added Vitamin E, it will enrich your skin with the vitamin and restore skin vitality that erodes in chemically treated water. While in your hot tub, you will not only enjoy clean and sparkling water but a new experience of a soothing spa leaving you relaxed and invigorated. It is parked in a 1-pint bottle for easy handling and convenience when applying in your water. The added conditioner may cause mild skin and eye irritation to some users with sensitive skin. When selecting your hot tub defoamer among the many in the market, there are some guidelines which can help you in making the best choice. You should have a keen eye to check out the features since the packaging can hoodwink you and end up buying a product you had not intended or an ineffective one. It is doubtless that you need to have the best solution that will be effective in removing all foam, protect your filters, and most of all protect your skin. Follow the guidelines to lead you to the best. Defoamers have different base making them different types. There are four common bases in most defoamers in the market. These are water-based, oil-based, silicone-based, and powder-based. The type of base gives the defoamer the effectiveness against eliminating foam. The four varieties of defoamers have their different ways of breaking the formation of the foam. Oil-based – These deformers are powerful in eliminating surface foam. The base oil is the one that dissolves and prevents the foam from spreading in the water. Silicone-based – The defoamer is powerful in breaking air-entrained foam and surface foam. It breaks the foam in the water by emulsifying it and eventually dissipating it effectively. Powder-based – They are typically oil based but with added silica carrier. They are mostly used in powdered detergents to eliminate foaming. The defoamer must be compatible with the water chemistry such as chlorine without interference. Also, the chemical in the defoamer must not only be able to eliminate foam but be gentle and safe for the skin and eyes. Your choice of defoamer must not disturb the pH and alkalinity level. Some of the defoamers can increase the pH level while others will reduce. Get a deformer which is friendly to pH and alkaline level without causing imbalance. The level of alcohol content in the product can affect water chemistry. Check out on its alcohol level to prevent interference with other chemicals. Getting rid of murkiness in water, due to soaps, body oils, shampoos, and many other chemicals buildups. After clearing up the residues, the water will be left sparkling and with a fresh look. This also is how to fix cloudy hot tub and turning water to crystal clear. Defoamer will save you emptying your hot tub after every foam onset. Effective defoamer will get rid of germs and other harmful skin bacteria from your hot tub water. It maintains the soothing and relaxing experience by preventing water from getting thick and gooey. You are sure of clean water through and through. A: There is no set standard of the times you will use your defoamer. But, to make sure you control foaming, use your defoamer alongside your other chemicals. Doing that, you will maintain clean and clear water with no formation of any foam. You don’t have to wait until foam sets. You can tackle it before then. All the products in this review are best to use in your hot tub when defoaming it. Our best pick is Leisure Time Spa Balance Foam Down (30241A) which has all the qualities you need in a defoamer. It also has good ratings and reviews from users. The best value budget choice is hth Spa Condition Defoamer. It has added value of enriching it with vitamin E to restore skin vitality from water chemical harshness. The best thing about this product, despite its price it does not compromise its high values. Have you made your decision yet and why is your pick the choice? Leave your comments on section here below. We would love to hear all about it.